It is the lower part of the city, just between Chiado and Alfama. 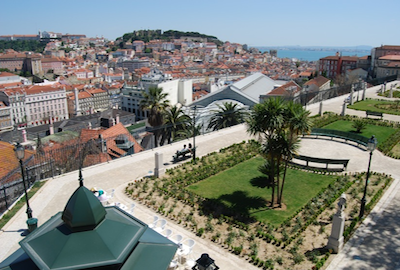 Here you will find the beautiful plazas of Rossio and Figueira. Worth walking down the Rua Augusta, which is main pedestrian street, and ends at the Augusta Arch that gives access to the Praça do Comercio, right in front of the river Tejo. You can go there by tram as well. There are trams leaving from Praça do Comércio and Cais do Sodre, headed to Belem. In Belem you will find the delicious Pastéis of Belém (look for the official pastry shop). In the area you can also visit the Jeronimos Monastery and the Belem Tower. And for modern art exhibitions you have the CCB (Centro Cultural de Belem). It is the modern area that was recovered after the 1998 World Expo. It is nice because it is also next to the river. It’s a good place to take a walk and discover a more modern side of Lisbon, see the Oriente railway station by architect Calatrava and also visit the Oceanario that is a spectacular aquarium.